Extra-thick and super tough DuraFirm arm and seat pads. Fully adjustable to accommodate all size users. Extra-wide base and bar cradle. Set to perfect 30 angle positioning the upper arm for maximum stretch and full range-of-motion while eliminating stress on your elbows and lower back. Body focus: Biceps, forearms and wrist. 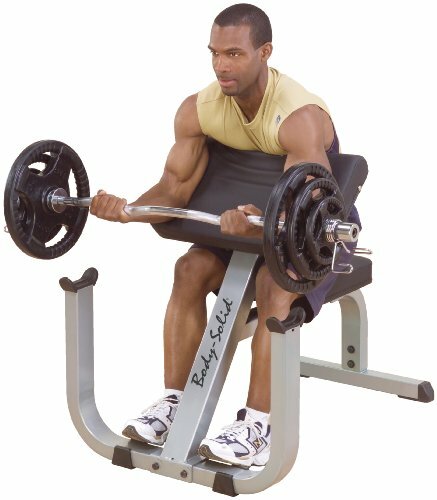 Exercises: Biceps curl (seated). Ideal for home and commercial use. Commercial rated. Made from full commercial high tensile strength steel. Mainframe: 3 in. W x 2 in. D. Overall: 41 in. L x 31 in. W x 35 in. H (74.36 lbs.). Warranty Instructions. Assembly Instructions. When it comes to isolating the biceps for maximum concentration and development, nothing beats the Preacher Curl! Preacher curls are essential for building overall biceps mass including the often difficult lower biceps.